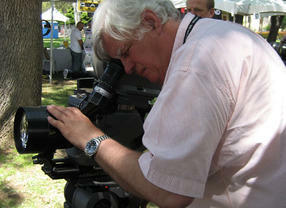 Find out more about the man behind the men behind the camera, Panavision's Joe Dunton. Joe Dunton MBE received the 2010 Outstanding British Contribution to Cinema Award in recognition of his long and influential career. 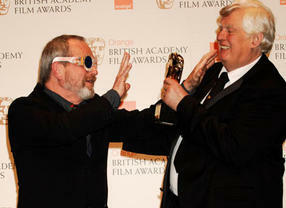 He was presented with the Award by Academy fellow in 2009, Terry Gilliam at the BAFTA Film Awards on Sunday 21 February 2010. 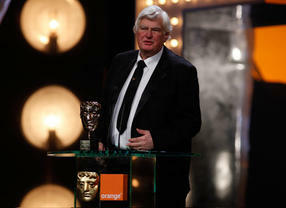 BAFTA/Brian RitchieIt might be expected of an industry veteran in receipt of lifetime achievement awards from various august bodies in the filmmaking firmament to be lost in the golden glow of nostalgia. Joe Dunton is not slow to reflect on the 42-year journey in cinema that has brought him to this point, nor to acknowledge the many directors, cameramen, operators and technicians who have populated his professional life. But Dunton, since 2007 an executive vice president at Panavision, is just as keen to look to the future and the many developments and challenges that lie ahead. Dunton’s own past association with film harks back to Carol Reed’s production of Oliver!, working alongside cinematographer Ossie Morris to create the first video assist on a Mitchell 35 camera. This provided Reed and his team of seven choreographers quick and easy access to the performances of some 400 dancers during the biggest of the film’s many musical numbers. Prior to this, Dunton had worked as a television engineer, then as a video engineer at Pye in London. His move into film was assured after Oliver! and, his enduring fascination with anamorphic lenses born, he would go on to establish his own company, Joe Dunton Cameras in 1976.
close collaboration with the industry colleagues he would soon call friends. Some of these inventions include the heated camera eyepiece, the Ladderpod, a video assist for the Louma Crane, the Moy Bazooka, the Mitchell Vitesse geared head and an HD camera magazine that is interchangeable with a traditional film magazine. Even now, as the analogue image increasingly becomes a digital one— the technological revolution to which he refers—Dunton is not afraid of change. Which raises the stakes further for the people who make the movies that will go on to be watched and enjoyed in a multitude of different platforms and formats. In interviews, Dunton has referred to Stanley Kubrick, with whom he worked closely after A Clockwork Orange in 1971, as a mentor. And Kubrick’s keen attention to detail and Dunton’s technical skill were always at the service of telling great stories in the most interesting ways. Dunton, a dedicated servant to a medium he clearly loves, would obviously have it no other way either. Over the years, his work with filmmakers on major blockbusters— and a great many more modest productions—has been marked by his interest in helping them achieve the best results possible. British Society of CinematographersMovies such as Poltergeist, Return Of The Jedi,The Mission, Secrets & Lies, Eyes Wide Shut, the Harry Potter films and Nine have all benefitted from his expertise. Now at Panavision he has begun a new chapter in his career, but the attention to detail and the aim of providing filmmakers with the tools they need to do their jobs as well as they possibly can remains unaltered. While recent years have seen Dunton honoured with an MBE, lifetime achievement awards from the Cine Gear Expo and the Society of Camera Operators, and now this recognition from BAFTA, none of it will have turned his head, or greatly changed his outlook. Presented annually, the award for Outstanding British Contribution to Cinema was introduced in 1978 and is presented in honour of Michael Balcon. The first recipients were the Special Visual Effects team for Superman and others include Kevin Brownlow, Mike Leigh, Kenneth Branagh, Derek Jarman, Lewis Gilbert, Channel Four Films, production manager Joyce Herlihy and stuntman Vic Armstrong.